DOWNLOAD Get the FREE software! Runs under: Windows 10 / 8 / 7 / Vista. Image Eye is a specialized image viewer — made for the sole purpose of viewing images as quickly and practically as possible — nothing else! You get a window with the picture only — no bulky menus, tool-bars or other fancy but annoying clutter. By default, even the window title-bar is hidden when you don't need it, leaving just a thin black border around the image. There's also are many handy and practical user interface 'tricks' (e.g. hit Ctrl–Alt–X to close all image windows). This software is "donationware". This is a type of freeware. It is 100% free for non-commercial use - there's no advertising, no time limit, no reg-codes, no crippled features. However, if you use and like it, then please consider making a donation here — as a "thank you", and to support its continued development. Read what some of our users are saying about Image Eye! The only image viewer you need for viewing & browsing images. Clean with no unnecessary menus and toolbars wasting desktop space. Small and very fast, highly tuned code. Reads all common image file formats. Image index feature with very fast thumbnail-icon creation. Adjustments can be saved non-destructively and re-applied the next time you open it. It does not attempt to be a half-baked editor, format converter, or media player. It does include a simple slide show scripting language. Deep color & HDR support: Specialized code paths for grayscale and color data, with 8- or 16-bit integer, or 32-bit floating point / color component - maintaining full precision for all image processing operations. High quality dithering: Floyd-Steinberg dithering is used for superior perceived image quality when displaying high bit-depth images. Asynchronous file I/O: Images are decompressed at the same time as data is being read - i.e. it doesn't wait for file reads to finish before starting to decode. Speculative decoding & caching of images: While you view a file, the next file in the folder is invisibly being decoded, so that it can be brought up very quickly. And when you move to a new image, the old one is remembered (if memory allows), so that there's little delay if you toggle back and forth between images. Data parallelism exploitation: Many heavy computational tasks are considerably sped up by using SEE, SSE2, SSE3 and SSE4 instructions. These "SIMD instructions" work on 4, 8 or even 16 numbers in parallel. Task parallelism exploitation: Heavy computational work is considerably sped up by dividing big jobs into smaller tasks that are distributed on multiple CPU cores (if available). Work stealing and dynamic load balancing techniques ensure that all cores are busy. Hand tuned code optimizations: Critical sections are optimized by hand. Code branching: Common cases are handled using specialized code that is faster than the generic routines. High quality resampling: All resampling (image resizing) is done using Catmull-Rom interpolation. Text meta data handling: Text info tags can be read from several formats - Adobe XMP, IPTC IMM, EXIF, PNG, TIFF tags, PSD, GIF and JPEG comments. Native code: x64 (64-bit) and x86 (32-bit) versions are available. Reads many file formats: BBM, BMP, CAL, CALS, CUR, DDS, DIB, FIT, FITS, GIF, HDR, ICO, IFF, JFIF, JPG, JPEG, LBM, PCX, PNG, PSD, RLE, SUN, TGA, TIF, TIFF. Supports Windows 7 / Vista's "Default programs" and "Open with" features for file associations. Animated GIFs and APNGs are supported. High-quality Catmull-Rom (4x4 filter kernel) resampling filter used when resizing images. Optimized (optional) SSE2, SSE3, SSSE3 and SSE4.1 instruction set code paths for much improved speed. Multi-core support for much improved speed. Can be run as a portable application (to e.g. run from USB stick and leave no trace). Available in several languages & can easily be translated into more! Image resolution and file format information is shown for selected files. Preview of the selected image file. The last viewed image is automatically selected and the file list is scrolled so that it is visible. The most recent folders from which an image has been opened are remembered in a list and you can go back again to them very quickly (this can be turned off for privacy). Open an index view of all images in the directory by pressing a single button. Launch the program and open images in multiple ways — choose the one that suits you best! You can launch it from the start menu, by clicking on a file in the Windows Explorer, or from an already open Image Eye window. Browse images in a directory using the index mode, or using the 'open image file' dialog, or from a viewer window using previous/next image commands, or by pressing down the mouse wheel (if you have one) and rotating it. The image adjustment dialog lets you adjust brightness, contrast, sharpness (using a true 'unsharp masking' algorithm), hue, saturation, gamma, luminance, red, green, blue, negative, rotation and mirroring controls. Image adjustments can be saved and automatically re-applied the next time you open the image file — all without modifying the original image file. File operations: Copy, rename, move, delete, erase. The erase command will wipe the file several times with random data before setting the file size to 0 then deleting it (bypassing the recycle bin) — use for sensitive data. Function to capture images of the while screen shots or of selected windows. View images in windowed or in full-screen mode. Freeze mode sticks an image to the desktop so that it can't be moved until unfroozen — and it is automatically opened again if you restart your computer. Zoom in and out using high quality filtering. Set images as the Windows wallpaper. The 'recurse sub-directories' command lets you optionally create an index displaying all files of all sub-directories. Optionally save thumbnail icons in a cache file on disk for even faster retrieval next time. Generate the cache automatically, manually, or not at all. Lossless compression of cache files. Select what ifno you wish to be displayed (directories, non-image files, names (1, 2, or 3 lines), comments, resolutions, file sizes, File dates, extensions). Sort the index icons in various ways. A slide show scripting language allows you to roll your own slide-shows and presentations. The 'Create slideshow script' dialog automatically creates slideshows for viewing of all the files in a directory using various options - in case you don't want to edit a script manually! Windows 10 / 8 / 7 / Vista. Install the program on your main computer using any of the above installers, then grab the Image Eye.exe file that was installed. If you run it on a computer where it has not been installed, then settings are not remembered - and nothing will be stored in the registry et c, thus leaving an entirely untouched system. This is useful e.g. if you want to run it from a USB-key on a borrowed computer. Volunteers are wanted to help translate it into more languages! Image Eye is Open Source. You can find the Source code over here. The code is provided under the GPL v3 license and is free for non-commercial use. Feel free to submit improvements and fixes - collaborators are welcome! Volunteers wanted for Image Eye translations! This is where you can help! If you'd like a version of Image Eye in your own language and are willing sit down a few hours and translate it, then it can happen! Interested? Contact us and we will get back to you with more information! For non-commercial use, Image Eye is "donationware". This is a type of freeware — you don't have to pay for it and there's no nag boxes, no advertising, no time limit, no crippled features. However we do make this plea: That if you use it and like it, you can make a voluntary donation — both as a "thank you", and to support the continued development of Image Eye. It has taken a lot of time to develop this software. You decide the amount to donate! For commercial use, please contact us and ask about low cost licensing options. Note: Your donation will be processed by PayPal. (please donate a minimum of USD 10, otherwise too much will be eaten up by transaction costs). Your donation will helps us greatly in continuing to improve Image Eye! If you are looking for a fast and quality image viewer program with a clean user interface, it must be Image Eye. It became my favorite program in short time. Also it doesn't use high system sources which makes it user friendly. Image Eye is the best software product I've ever purchased, I use it all the time and you always advise me of updates. I am an amateur photographer and scan in quite a few of my photographs. Image Eye provides the best displays of any software I have used when I show friends my photos. I assume it has to do with the method you use to dither, in any event my photos have a very smooth look on the monitor with your software. I have tried quite a large number of commercial, shareware and freeware programs but Image Eye produces the most pleasing results for viewing of any I have used. I must let you know that immediately after downloading Image Eye three days ago, linked from Voyetra, I wanted to register first chance. I am very pleased with the output quality and slick presentation. Unabashedly, I must tell you that this program is one-of-a-kind, not-to-mention the brains behind. The Indexing, slideshow and view options. 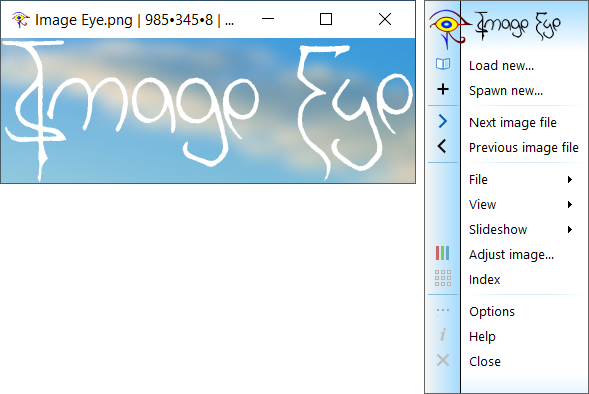 Image Eye should be part of the Windows system. I can't say how often I'm using Image Eye, because it is part of my system.